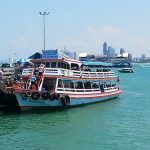 Here are the four common ways to get from Bangkok to Nakhon Ratchasima or better known as Korat. This is how I went there last weekend. Take the MRT (Underground) to Kamphaeng Phet station and from there by motorcycle taxi to Mo Chit Northern Bus Terminal (30 Baht). Go up to the second floor, that’s where most of the ticket booths are located and that is where you book your bus ticket to Korat. I got a 2nd class air con bus ticket for 171 Baht one way. There are also VIP buses with bigger seats available (three seats in one line) and they cost 220 Baht one way. The trip normally takes 4 hours, however last Saturday as I went lots of Bangkokians went back to their home town due to a public holiday the following Monday so it actually took me five hours to get there. The good thing about taking the bus to Korat is that you can get off wherever you want and you don’t have to go all the way to the bus terminal which is located at the northern end of the city. If it’s your first trip to Korat I can recommend you to get off at “Terminal 21”, Korat’s biggest shopping mall and the place where everyone seems to hang out during the day. If you travel back from Korat to Bangkok you can either take the bus from the old Bus Terminal (see right picture) located in downtown or, preferably for newer coaches, the new Bus Terminal 2 (see top picture) located on the main road near Terminal 21 Shopping Mall. Unfortunately most hotels don’t have drop off services to the bus station (if they have one then usually to the airport) but they can call you a taxi and the fare will come down to around 100 Baht (including the 40 Baht service charge). That’s maybe the quickest way to get from Bangkok to Korat overland however you might also have a hard time with not much legroom during your journey if you get a bad seat. The minivans also leave from Mo Chit Northern Bus Terminal (see the description above on how to get there). One way tickets cost between 180 and 220 Baht and the trip takes about 3 hours (slightly faster than the big busses). The good thing about taking the train is that there is no traffic jam involved in your trip. However it takes several stops along the way and can take up to 6 hours depending on the type of train you catch. The easiest way is just by asking the ticket vendor for the duration, delays for this distance are not very common. Trains from Bangkok to Korat leave from the Hua Lamphong main railway station that can be easily reached by MRT, take it to the last stop on the line (there is only one MRT line). If you go outside you are right in front of the railway station. If you want to travel back from Korat to Bangkok you can check the departure times here. The railway station in Korat is conveniently located right in the city center (see picture). The flight time from Bangkok to Korat is only about 30 minutes but keep in mind that it takes also time to get to the airport in BKK, wait for the flight and get to downtown Korat from the airport which is located about 40km from the city. So it might be just about the same time (and less hassle) to catch a van or a bus. There are currently no flights from Bangkok to Korat. The government has actually plans to build an express train from Bangkok all the way to Southern China that will stop in Korat and do the route in less than 2 hours. I’ll update this page in the future as soon as any new services begin. 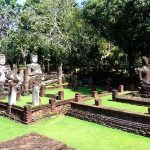 Now that you know how to get from Bangkok to Korat, check out this post to find out what to do in Thailand’s second biggest city. I have a huge luggage , possible to take the vip bus from Bangkok to korat? I don’t know how huge your luggage is exactly, but the busses always have big storage rooms. Should be alright.